PLATO History: Greetings, Ars Technica Readers! Hello many Ars Technica readers who came here from Richard Moss's big article on the history of some PLATO games published over there on that site today. 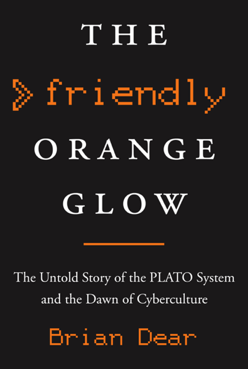 If you would like information on THE FRIENDLY ORANGE GLOW: The Untold Story of the PLATO System and the Dawn of Cyberculture book, coming from Pantheon Books in the Fall of 2017, please click the book title link or this link to go straight to the official friendlyorangeglow.com book site for more background and info on the book.